Back Bay Books, 9780316354653, 304pp. In a civilized society, violence is rarely the answer. But when it is-it's the only answer. The sound of breaking glass downstairs in the middle of the night. The words, "Move and you die." The hands on your child, or the knife to your throat. 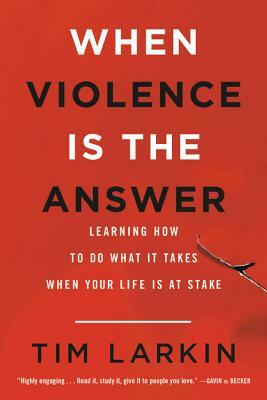 In this essential book, self-protection expert and former military intelligence officer Tim Larkin changes the way we think about violence in order to save our lives. By deconstructing our assumptions about violence-its morality, its function in modern society, how it actually works-Larkin unlocks the shackles of our own taboos and arms us with what we need to know to prevent, prepare for, and survive the unthinkable event of life-or-death violence. Through a series of harrowing true-life stories, Larkin demonstrates that violence is a tool equally effective in the hands of the "bad guy" or the "good guy"; that the person who acts first, fastest and with the full force of their body is the one who survives; and that each and every one of us is capable of being that person when our lives are at stake. An indispensable resource, When Violence is the Answer will remain with you long after you've finished reading, as the bedrock of your self-protection skills and knowledge. Tim Larkin is one of the world's foremost experts on the subject of violence. As a former military intelligence officer, he was part of a beta group that redesigned how Special Operations personnel trained for close combat. Over the course of his 25-year career, through his company Target Focus Training (TFT), he has trained more than 10,000 people in more than 50 countries how to deal with imminent violence, including elite combat units, celebrities and high-status executives, law enforcement agencies, and high-net worth families. Larkin is also the author of the New York Times bestselling book Survive The Unthinkable. He lives in Las Vegas, NV.